While I was working on my latest sock design, I began to pay particular attention to my color change where NA(needle A) and NB (needle B) meet as I start a new round. Normally, I make this back seam design lie in the center of NA, but this time I decided to put it at the beginning of the round. Why? Since these few stitches involve changing colors more often, it forms a firmer, less stretchy surface; therefore it is a great place to hide and secure any loose floats that happen to be hanging around. By working your extra yarn across to this area, from either side, you can tuck them under and stitch them down, with no one the wiser. Below is a photo of the area in question. You will notice that there are 5 red stitches between 2 black ones, this is the center back pattern of my Nordic Rose knee high. These stitches are riding on NA. NB is laying on the counter to the right, with its cord pulled across the surface of the knitting to the left. 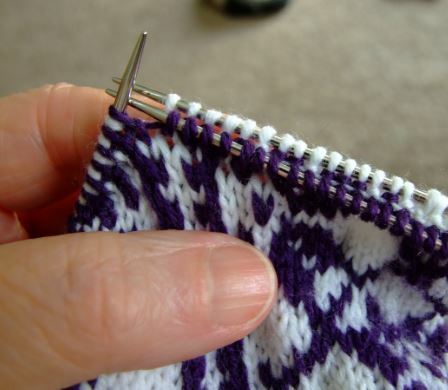 You can see how this move frees up the stitches to lie closely together, just as if you would be working on a straight needle. However, there is another move that is just as important, freeing the stitches at the other end of needle A to ride on the needle tip. See photo below. You can see that I have pushed the stitches onto the needle tip so that they might ride smoothly on the needle itself and NOT on the cord. With these two moves completed, I can make a smooth transition when starting my next round, eliminating any loose stitch at the beginning. I use the same procedure when I make the transition from NA to NB in the middle of the chart. Yarn Over or Yarn Around Needle? One of my discoveries in dealing with the “yarn over” issue is the uneven holes that are created by the traditional method. If you are working in a lace pattern, it is not hard to see that the YO purls are a bit larger. Why, because they are really “not” a yarn over, they are in fact a “yarn around needle,” creating a full loop. Since I am a bit picky about my knitting, I tried some experiments. The easiest answer, was to mirror the traditional yarn over. Yep, that fixed the problem. From that point on, when instructed to make a YO purl, I bought my yarn to the back, and purled the next stitch. 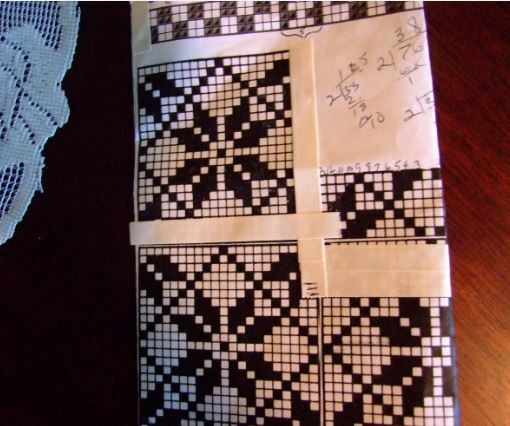 Now, my holes in the lace pattern were the same. Next, I experimented with the “yarn around ” needle. It works just as well. The key is to have the lengths of yarns creating the yarn overs, or around needle, the same. I use the “yarn around needle” to increase stitches. It makes a very nice transition. Below are some demos illustrating both methods on the knit side. For the purl side you would just reverse the process. This first demo shows the yarn being brought forward in preparation to accomplish the , YO(yarn over) knit. 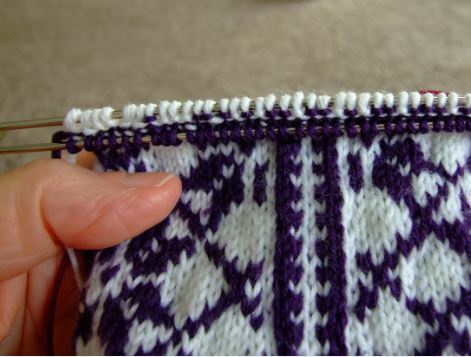 This is the traditional method, but actually creates a half loop between the two stitches. 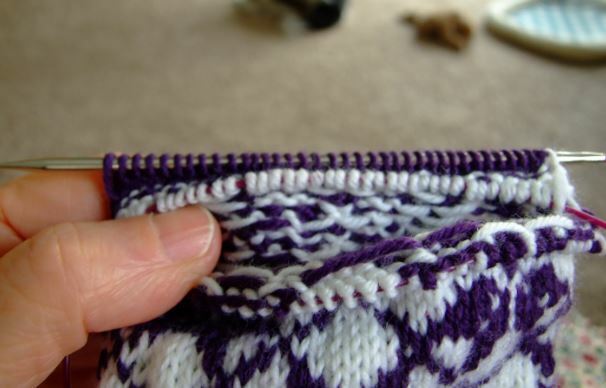 The second demo illustrates creating a yarn around needle by bringing the yarn over the top of the needle and then again to the back in preparation to knit the next stitch. 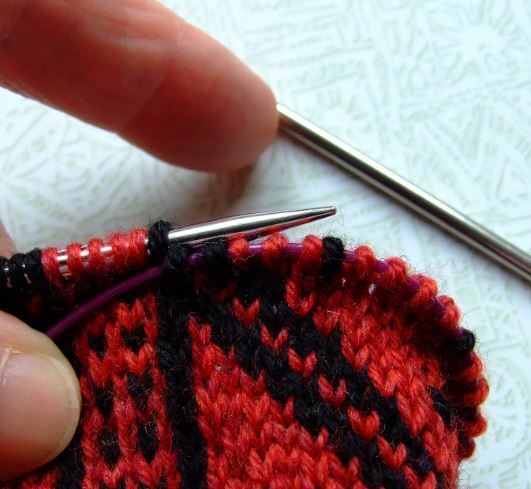 This method make a complete circle around the needle, creating a full stitch, or loop. Either way, I get the best results by doing a swatch of each type of yarn over before getting into a complicate piece of work. The goal is always to make you stitches look even. 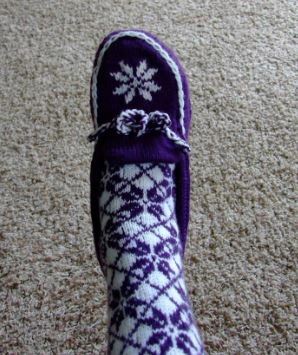 After completing the Nordic socks, I ventured to come up with a double knit heel to replace the two I knitted in the original design. Below is a photo of the results. I began this heel “test” with a provisional crocheted chain of waste yarn, ( as I do all my experiments),then picked up 37 sts using the MC, then set up my double knitting row. 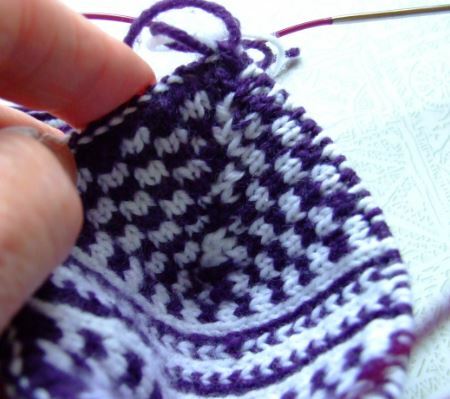 Setting aside the 5 stitches in the center, I worked a alternate checker board design for the rest of the heel. I treated the short rows the same as I would if I were working with a single thread, except for the fact that I brought both yarns to the back when slipping the front knit stitch, and both yarns to the front, before slipping the back purl stitch. Below is a photo of the inside. Here is a photo of the completed turns. Both sides are completely finished and ready to complete the rest of the sock. 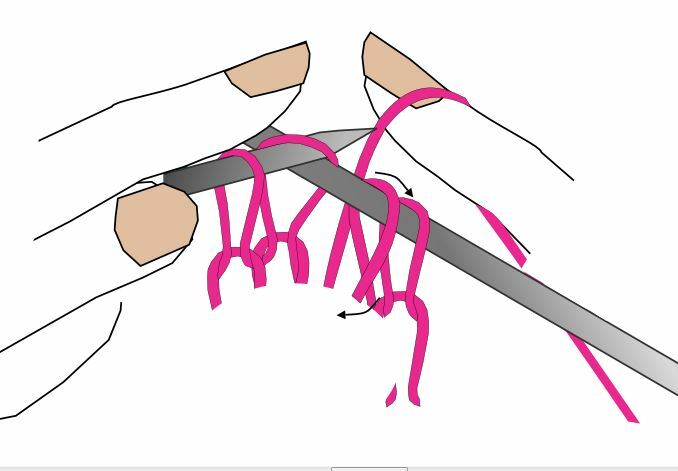 You can also use this method to make you toe section. I closed the short rows in the same manner as I use in J’ Short Row Heel instructions, using the appropriate color to retain the design. The only difference is that you will be working one side at a time. After completing the knit side closure, I bring the yarn to the front, then turn the work around. With the left needle tip, I pick up the slipped st in the row below the stitch to the right of the slipped st, place it on the needle, then turn the work again back to my original knitting position, then purl the two stitches together. The rest is the same. I have charted this design, you can upload to practice with in the near future, but for now, it’s something you might think about trying. The instructional PDF includes several charts for you to choose from. I have also included some illustrations. 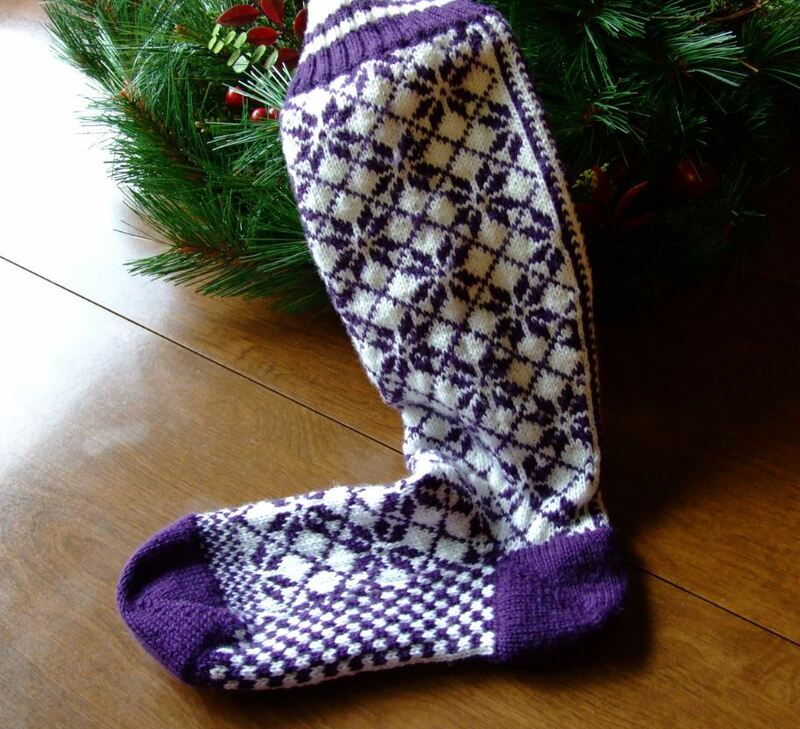 I definitely will be using this in my next knee high stocking design, and my husbands socks as well. I thought I might let you in on my secret of keeping them UP! I have found that elastic thread crocheted to the inside of the top of the rib does a good job. You might also notice, if you take the time to look at some of the commercial socks, they also use this method. It is really easy to do. Using a small crochet hook, make a slip knot in the elastic thread leaving about 6 inches for a tail. I begin my crocheting about 2 sts down from the top edge. I use the knit 2 sequence of the rib to anchor the crocheted chain, then chain 2 between the sections of the rib. 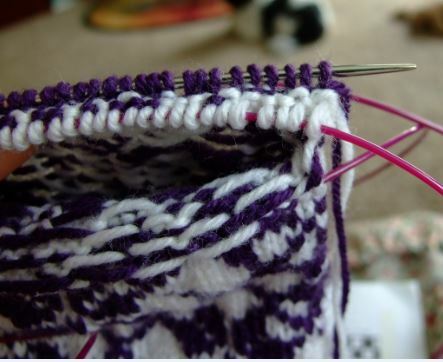 Slip stitch you elastic into the right leg of the first selected knit stitch, then slip stitch into the left leg of the knit stitch directly to the left. The next step is to chain 2(which take care of the purl 2 section), then repeat the 2 slip stitches as before in the next group of knit 2’s to your left. The tension you use to hold back on the elastic thread will determine how tight it is, so be gentle. When you have completed the round, leave a 6 inch tail and pull the elastic through the last slip stitch. DO NOT TIE IT OFF. Put the stocking on, and see how it works. If you need to tighten it a bit, then simply release the elastic, pull it out and tighten your tension a bit more. You can work 1-3 rounds of this elastic chain, spacing the chains about 2-3 stitches apart. I made my second round 3 stitches below the first round. 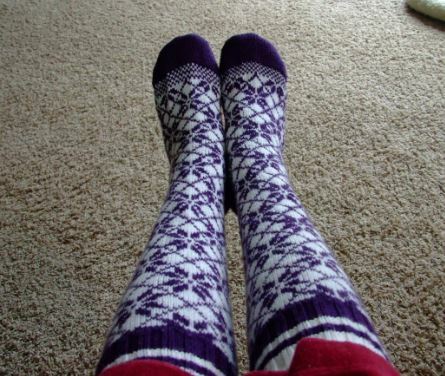 Here is a photo of these knee highs paired with my Twine knitted moccasin. As I was working on the second sock I decided to take some photos of the double heel set-up. 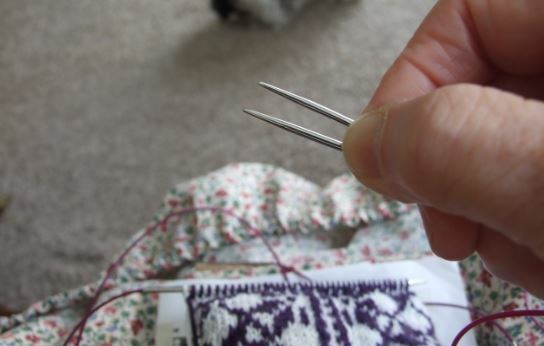 First, let me say that I have discovered that using a needle at least two sizes smaller for setting up double knitting, gives a much smooth transition than doing it with the needles designated for the field. 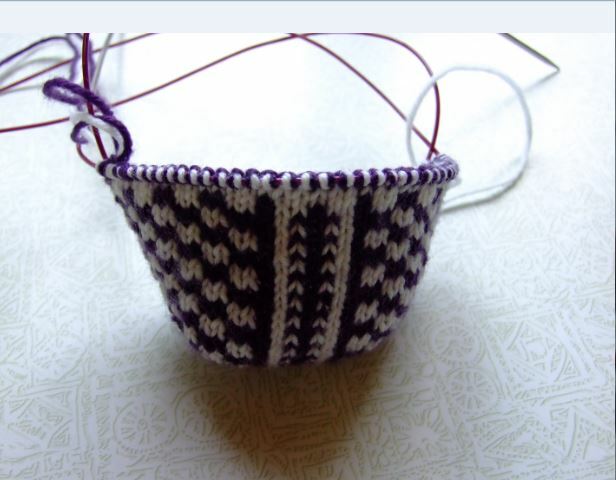 So…, since I am using a #3 for the main knit, I will be using a #1 when setting up the double knit for the heel. Using my #1, I knitted the first stitch with the MC, leaving it on the needle, I brought both the yarns(MC and CC) through to the front; with the CC I purled into the same stitch. To repeat, bring both yarns to the back, then knit the next stitch with the MC. Bring both yarns front, and purl in the same stitch. 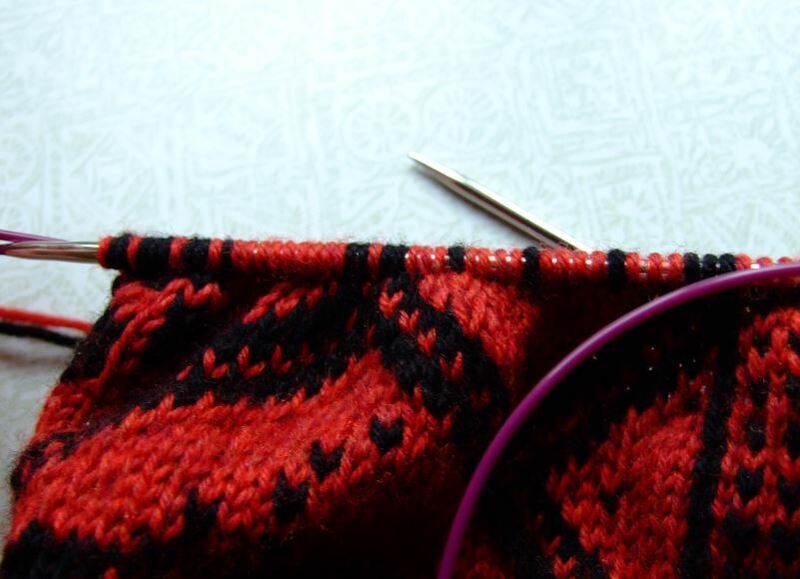 Work all the heel stitches this way. You should have twice the amount of heel stitches on your needle. The next step is to pull the #1 through all the way so that the stitches are now on the right end tip of the circle needle. This puts them in position to be slipped off onto the two tips of the #0 needle. Pick up a #0 circle needle. Fold your #0 in half so that both ends face the same direction. You can see that I have positioned the tips between the thumb and index finger of my right hand. By rocking my wrist forward and backward, I pick up the MC from back to front, with the nearest needle, the CC stitch is picked up in the same manner, with the farthest needle. The trick is to keep your right hand thumb on the stitches just picked off. You can see in the photo above how it looks as you progress across the row. Once you have them divided onto the two points of the needle, it is time to set up for knitting the MC heel on my #3’s. 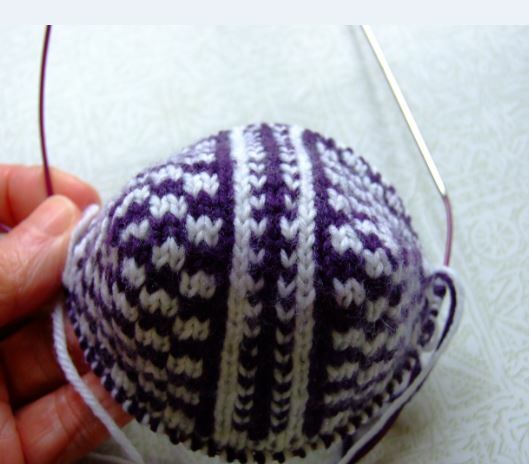 To do this just turn the needles around so that the working yarn is on you right. Now pull the #0 needle holding your CC through, so that the stitches ride on the cord. 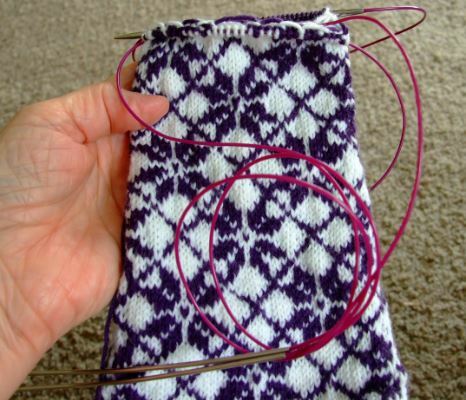 *Note- you will find that knitting off the #o holder, leaves you ample room for the larger needle and makes a smooth transition. 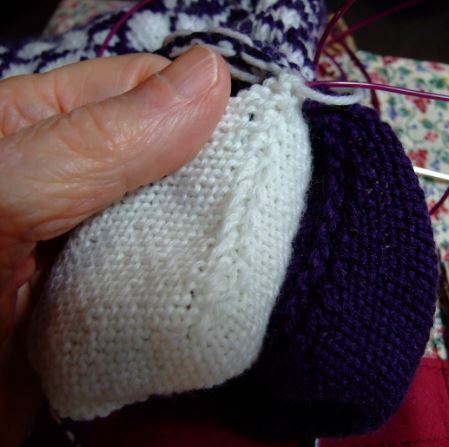 Next, pick up the #3, slip the first stitch, and purl across, beginning your short row heel. Once the #0 is released from this row, pull it through so both side hang out evenly. I actually tie a loose knot in the coil and let it hang. 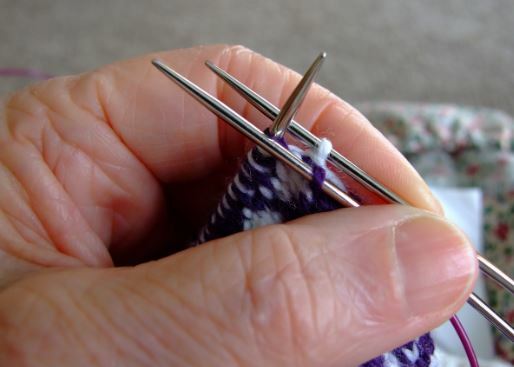 This needle serves as a stitch holder for the CC stitches of the inside heel. Complete the MC short row heel, ending on a knit row. Why? This will set up our working yarn in the proper order to complete the round that was interrupted when the heel was begun. 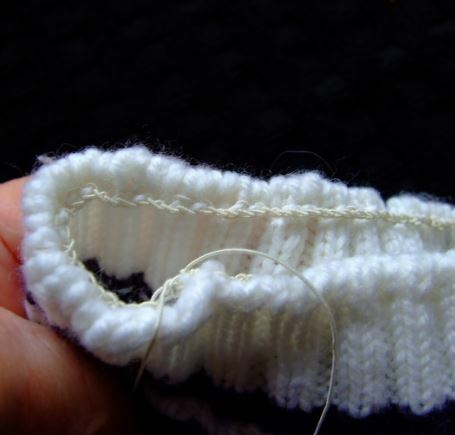 After transferring the finished MC heel stitches onto a spare #1 or #0, beginning at the right edge, with the purl side of the MC heel facing you; with #0 needle, pick up the stitches for the inside CC heel. 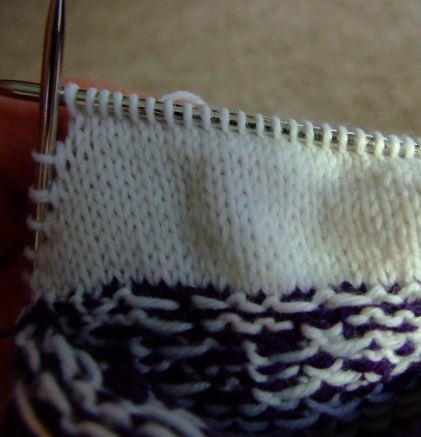 Here you can see the stockinette stitches of the inside CC heel. 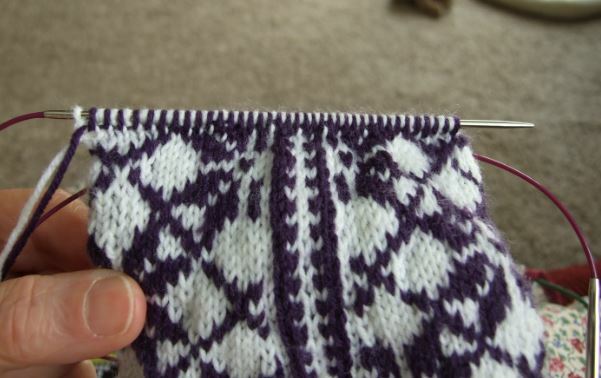 Beginning in the knit side, complete the short row heel, ending with a purl row. Now both working yarns are in position to complete the original round. Below are some photos of the completed heels. You will notice that the purl sides oppose each other. Once the two heals are completed, line up the short row turns as shown in the photo, and loosely stitch them together, weaving in the ends of your yarn. I have found that using a piece of the MC works best. 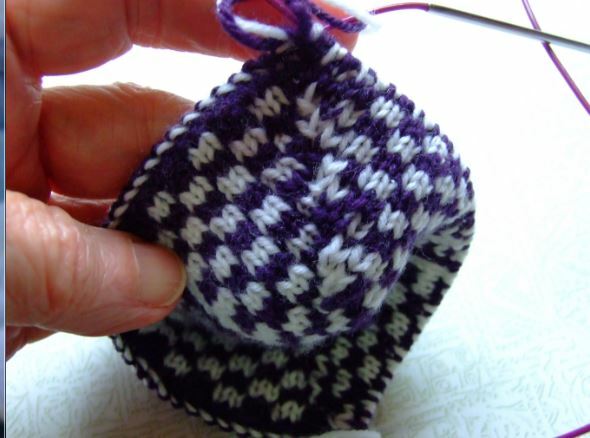 Now turn the heels inside each other, both sides should be in stockinette. 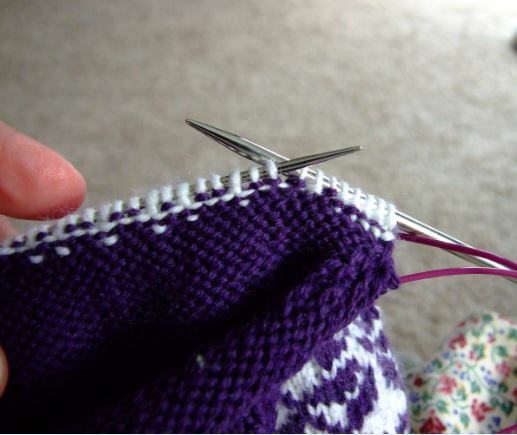 Slip the stitches alternately back onto your the right tip of your #3 needle. Pull the cord through, in preparation to complete the original round. The heel stitches riding on the cord should in the same order as in the first photo in this post. Now complete you chosen chart for the instep section. 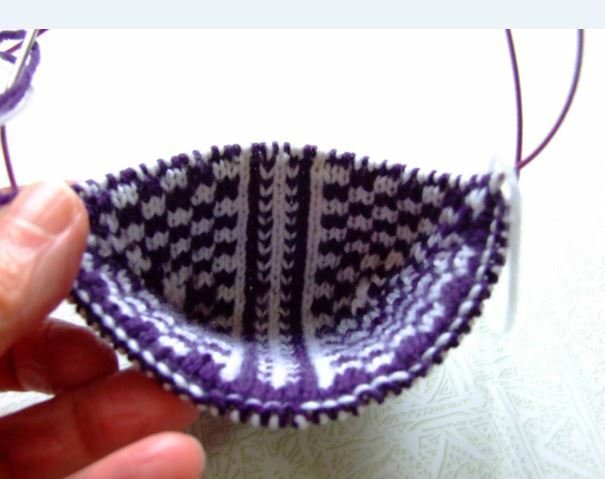 When you come to the heel portion with the two colors, knit the MC and CC together with the MC. At the same time you will be weaving in the CC behind every other stitch. From this point on you just complete the charts you have chosen for the instep and sole section until you get to the toe. 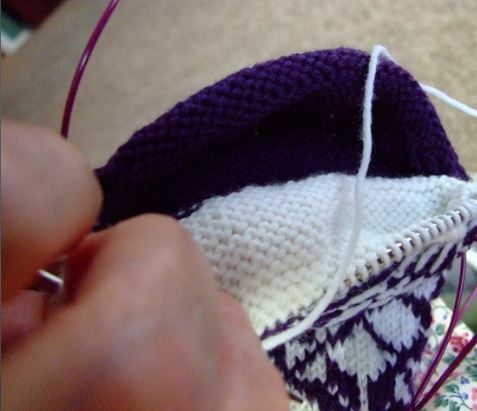 Repeat the process as for the heel on the amount of chosen stitches. Join the two together, and Kitchener stitch the remaining stitches to the matching sole stitches. * I interlock the first and last two stitches, before I start my Kitchener in order to eliminate the bulk at the beginning and end. Using 2 #0 DP needles makes this process much easier. Click on the link to “Techknitter” for instructions. Chart tips-For this and any other project requiring a chart I have found that “whiteout tape” you can get at Staple or stationary supply, works great for keeping track of where you are. It peels off easily and can be moved up the chart as required. You will notice in this photo that I also have used it to mark the out the section for the heel. As you can see it great for any application where you need to mark your progress. 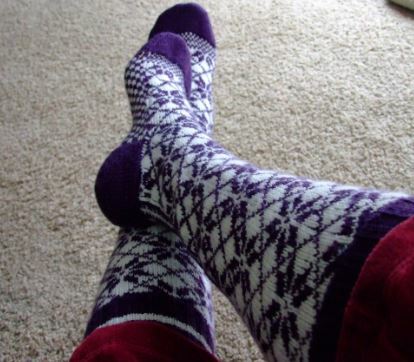 PS- You can find the original version of these stockings at Knitting Daily. *The original stocking, uses a Shepherds heel. It works well, but I prefer the short row version.